Fri-Yay: Bob's Burgers Tops Sunday Night on Fox; WGN America Gives Thanks with M*A*S*H and More! If there's a show on network TV that is the epitome of the underdog, it's Bob's Burgers. Bob's Burgers debuted in 2011 to relatively little fanfare - at the time, FOX's animation line-up was dominated by Seth MacFarlane shows (and the ever-present Simpsons), and Bob's Burgers stuck out like a sore thumb. Early episodes of Bob's Burgers tried to use some MacFarlane-esque shock humor to blend in with the line-up, but it was clearly it wasn't really what the show was comfortable with. Bob's received a lukewarm critical reception and so-so ratings, but it showed enough promise that FOX renewed it for a second season and some critics began noticing its potential to become something bigger. Seven years later, Bob's Burgers has become something of a low-key phenomenon, a critical and fan darling that's beginning to finally reach mainstream acceptance. 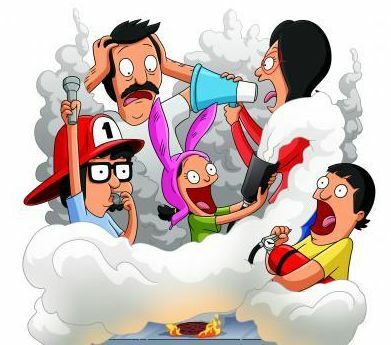 Bob's Burgers started churning out consistently great episodes in its second season, and by its third season it had become established as one of the best comedies on television. The show's blend of off-the-wall humor with sweet family moments yearns back memories of early Simpsons episodes with a bit of an absurdist, Adult Swim-like touch. The show's biggest feature is its relentless optimism and acceptance of just about everyone that turns up in its weirdo family's orbit, and it's that acceptance that has made Bob's Burgers such a hit with its devoted fan-base. It has begun to occupy that same "alternative" young audience space that animated comedies like The Simpsons, South Park, and Family Guy achieved before it, but with a more pronounced sweet spot than any of those shows. Eight seasons in, Bob's Burgers seems to only be getting more popular - it was FOX's highest-rated program last week (beating out The Simpsons and Family Guy). It's been a long road, but Bob's finally seems to be getting the recognition it deserves as the weird, sweet, and incredibly funny comedy that it is. WGN America celebrates everyday heroes who serve and protect this Veterans Day weekend with back-to-back airings of Men of Honor, a five-hour M*A*S*H marathon, and fan-favorite episodes of Cops and Blue Bloods. Then WGN America cooks up a "Slapsgiving" mini marathon of How I Met Your Mother and a "Be Thankful You're Not on 'Cops' Marathon." Following WGN America's live coverage of McDonald's Thanksgiving Day Parade, viewers can continue enjoying the long holiday weekend with two America's Funniest Home Videos marathons, another Cops marathon and a movie marathon filled with extraterrestrial fan-favorites. On Veteran's Day, Saturday, November 11: "Serving with Honor Weekend" featuring a five-hour M*A*S*H marathon starting at 1pm ET, followed by back-to-back airings of Men of Honor. On Monday, November 20: "Slapsgiving" marathon featuring four back-to-back episodes of How I Met Your Mother starting at 1am ET.